My daughter thought of the idea at the beginning of the year. Could not find a costume so we had to make one. We bought two 5 foot long wigs and one 3 foot long wig. I fitted it to her head and sewed the wigs together. Then you add a black derby hat and glasses. For added effect she wore all black under neath and i glued some of the hair to black gloves. The gloves were for when she went to grab candy her hands were hairy also. 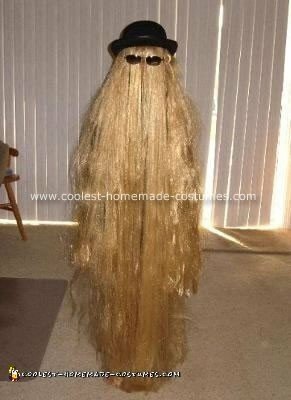 I have done Morticia, Wednesday and Uncle Fester but never considered Cousin It! Fantastic! where did ya get the wigs from? Where did you buy the wigs? Where did you buy the wigs? I am having problems locating 5 foot wigs and a matching 3 foot wig. Could you describe how you did this in more detail? I want to attempt this for upcoming Halloween. Was the wig expensive? How much did it cost? Not as good as my wife’s. I purchased the wigs from eBay, and the 3 foot wig was a Hanna Montana wig. place on my daughters head and sewed each wig together. If I remember right it cost me approx $60 to make.